A leading North East independent school has opened the doors of its half a million pound technology centre which will benefit both its students and the local community. 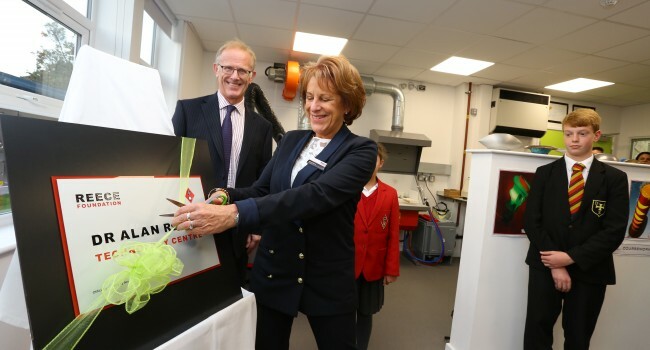 The Dr Alan Reece Technology Centre was officially opened by Anne Reece, daughter of the renowned North East engineer, at a bustling event which saw leaders in businesses and education come together to celebrate the new centre. Dame Allan’s Schools were able to embark on the project thanks to a generous £250,000 donation by the Reece Foundation, which promotes the improvement of education in engineering, technology and related subjects. The Foundation was set up by the late Dr Alan Reece in 2007 and its work is continued today by his family. The Dr Alan Reece Technology Centre builds on a history of innovation in science, technology, engineering and maths (STEM) subjects. Dame Allan’s is proud to have had one of the first physics laboratories in Newcastle on the former site on College Street in the city centre. The centre is kitted out with exciting, state of the art equipment including 3D printers, laser cutters, lathes and sophisticated software. The equipment was being showcased by Dame Allan’s students on the opening night, with visitors impressed not only with the kit, but also the skill with which it was used. Local link primary schools will also be able to make use of the advanced facilities, building on the Schools’ existing master class programme which aims to introduce children to different subjects and technologies that they may not have at primary school. The new centre brings with it new jobs, Mr Scott Sweeney joins the Schools as Head of Design Technology and Mr Adrian Park as a new IT and design teacher. Dame Allan’s anticipates that this significant investment in STEM subjects will enable the Schools to help plug the skills gap in the sector. The Royal Academy of Engineering has estimated that around 820,000 science, engineering and technology professionals will be required by 2020 – with 80 per cent of these required in engineering. Engineering UK estimates that based on the needs of current technologies the number of people leaving education with STEM qualifications must be doubled to meet this number. The Girls’ School at Dame Allan’s is also keen to redress the gender imbalance and hopes to build on the strong foundation of alumnae in high ranking STEM careers. One such Allanian is Professor Ruth Gregory, lecturer at Durham University and a governor at the Schools. Professor Gregory specialises in physics and maths and was the first woman to be awarded the prestigious Maxwell Medal by the Institute of Physics for her work into understanding the structure of the universe. The Girls’ School exam results this summer showed that this culture of girls excelling at Dame Allan’s is still thriving, with eight out of ten papers sat being awarded an A or A* grade. One of these students was Nicola Lines who achieved all A* grades, and an A** in Further Maths, at GCSE. Nicola is now studying Maths, Physics, Art and Geography in the Dame Allan’s Sixth Form and she will benefit from the exceptional facilities in the Dr Alan Reece Technology Centre. Also in attendance at the opening event was Lucy Winskell OBE, Pro Vice-Chancellor of Northumbria University and High Sheriff of Tyne and Wear. Lucy attended in her capacity as High Sheriff, an appointment made by the Monarch, having chosen to focus on education and the way it can transform lives during her year in office.